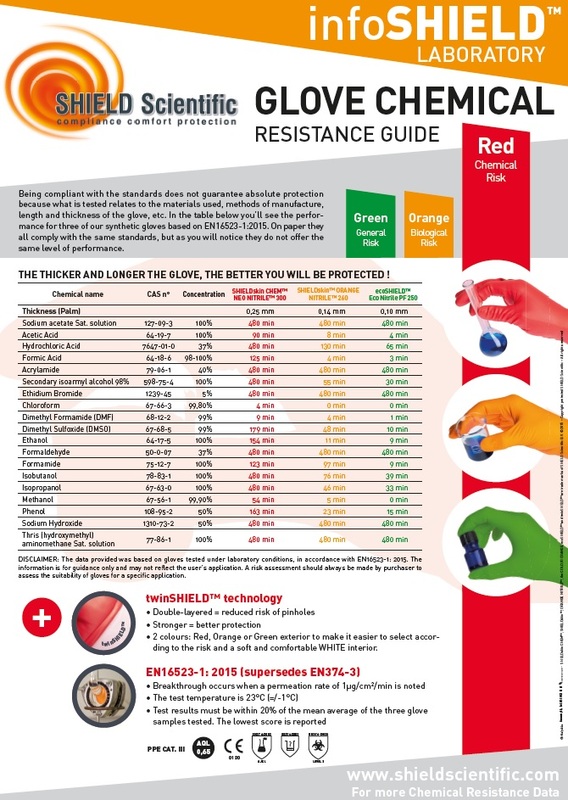 Adopt the SHIELD Scientific chemical resistance guide to compare, select the disposable glove offering the best performance! Click on GLOVE CHEMICAL RESISTANCE GUIDE to start selecting a disposable glove. Or DOWNLOAD our poster “The most commonly chemicals used in molecular biology”. TO DISCOVER OUR NEW SHIELDskin CHEM™ NEO NITRILE™ 300 , contact us. Manufactured with innovative twinSHIELD™ technology (double layers and twin colours for improved protection) to offer optimum “compliance, comfort and protection”.